Whether its the high cost of regular housing, the feeling of debt weighing down on your shoulders or just a feeling that you want to re-focus your life on more personal pursuits, building a tiny home can often help you to move towards a simpler, happier and financially free life. 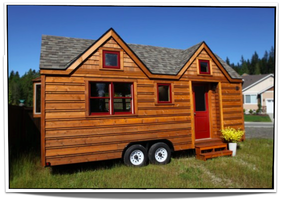 And by building yourself a tiny house on wheels, you are also able to build whatever you want, however you want. There are often no planning permission forms or building permit consents that you are needed prior to starting because you are building these houses on wheels / a trailer. Simply find yourself a suitable platform (trailer) and start building. Here, we will introduce you to a few good ideas, designs, examples and options for your journey forwards into the world of tiny homes. Enjoy! As a starting point here, let us share a few tiny house tours which can help to spark some interest, share some ideas and show you how wonderfully freeing, open and simple it can be to go tiny. 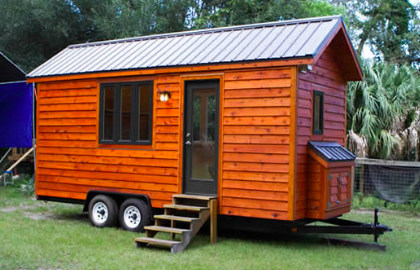 In this first example, we can see a very simple and stylish tiny home which is 8m long x 2.5m wide x 4m high. Most of these materials were recycled from salvage materials as a result of the devastating Christchurch earthquakes so this adds to the cost effectiveness of the structure. There is a sleeping loft built into this and we love the really nice feeling of space here throughout the place, promoted by the bar stools, the kitchen bench and the awesome bi-fold windows! In the world of tiny homes, this one is quite famous. This 'house' measures at 28ft long x 8.5ft wide, giving it a total floor space of 221 square feet (+ 2 additional lofts totalling 128 square feet) and is a great example of something that could easily accommodate 2 people. This house was built for under $23,000 for the structural elements with an additional $10,000 or so for the internal finishings. It includes two sleeping lofts and a full sized kitchen also. Measuring at 7m long x 4.17m high (around 15.5 square metres not including the deck area), this is a tiny house that will certainly leave you with the feeling that a tiny home can actually feel like a small apartment! We love all the space saving ideas, the off the grid power source and the super spacious sleeping area. This design, although looking a little quirky on the outside surely does help to give more overall space and 'luxury' on the inside! The tumbleweed brand is quite a famous one and with this tiny house tour, we want to show you a simple, lovely and wonderful example of how living tiny can feel just right for 1 person. This design has a gable roof, a sleeping loft, a wonderfully unique 'pink' room and lots of simple and humble fittings and fixtures. Overall, a charming, simple and suitable tiny house design which we feel would be a great option for a single person. Enjoy! From what we have seen, most tiny houses try to use a sleeping loft where possible to help open up the space and provide more 'living' area. However we also understand that this increases the complexity and cost of the overall build. Therefore, with this tiny house tour, we wish to show you a very interesting design that doesn't have a sleeping loft. With this tour, you can walk around a 'one story' tiny house so that you can see if this feels right for you. 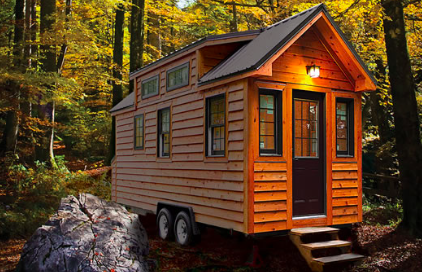 With the growing popularity of the tiny house movement, we are now starting to see a wider variety of tiny house plans being made available online which is great. By using these kinds of 'ready made' house plans, it can help to save us time and money during the building process and helps to make things run a little more smoothly. Enjoy!